There are few other measures in the first movement that is worth mentioning. First of all, it was my intention to focus my compositional method on a simpler use of the synchronization buttons i.e. the middle finger button to start/stop, and ring finger button (4) to jump and start. Therefore at the beginning, I try to make the use of the buttons as comfortable or as easy as possible. it is no coincidence that the first two synchronization points happen before and after a fermata since it gives the conductor a sudden amount of time, a breath or freedom. Next synchronization point in measure 28 – 29 does not come on a fermata but comes in a measure where there is very little to conduct since there is only a clarinet ostinato. Therefore the conductor has a good time to press the buttons for stop and jump/start. The sync. point in measure 36 – 37 and 49 – 50 occurs at a fermata as the first two points. 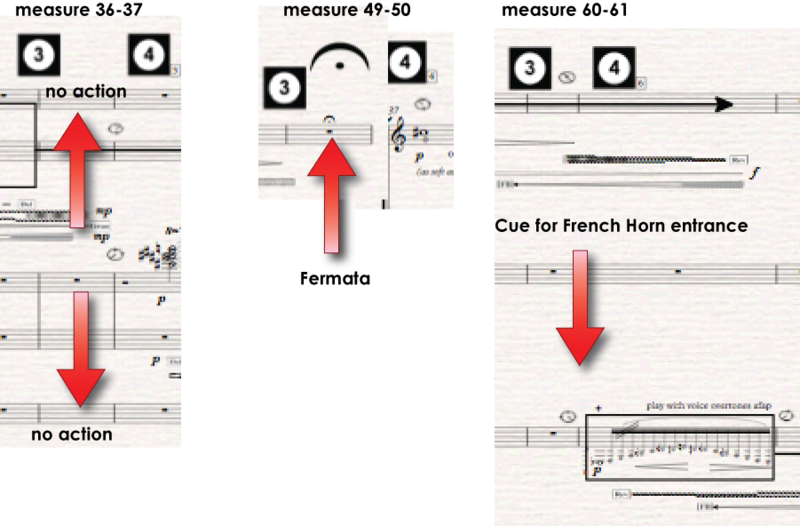 The following synchronization point in measure 60-61 is slightly different than the others since here the conductor has to give the horn player an entrance cue at the same time she synchronizes the Score and DAW. Still, all these synchronization points are all at rather comfortable moments and continue to be so throughout the 1st. movement.